If you have questions about Autumn courses, the application and admission process, costs, etc., contact Bernadette Holthuis. Students are encouraged to apply as early as possible, but applications will be accepted after July 1 if space is available. For the MBQ program, students select a combination of courses for a total full-time enrollment of 12 or more credits. 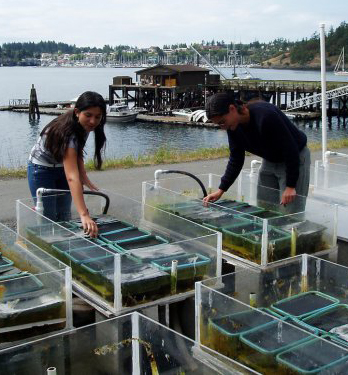 The Marine Biology Quarter and Research Apprenticeships run for an academic quarter (10.5 weeks). Classes require a full-time commitment and are held Monday-Friday 8:30 am-5:00 pm (some courses may have evening sessions). Students should plan to arrive Tuesday September 25 after 3:00 pm. First meal served for students is dinner that Tuesday, 6:00-6:30pm. Students may depart any time after 5:00 pm on Friday December 7, or may stay overnight and depart on Saturday December 8 by 9:00 am. Last meal served for students is breakfast on that Saturday, 7:45-8:15 am. Thanksgiving Holiday: no classes will be held on Thursday or Friday, November 22 & 23. The FHL Dining Hall will be closed after lunch on Wednesday November 21, staying closed until it re-opens for dinner on Sunday November 25. Students may choose to stay on campus during the holiday weekend, and will be given access to cooking facilities for those four days if requested. While credit for FHL coursework is earned through the University of Washington (UW), you need not be matriculated at UW (or any other university) to register for a course at FHL. Students must apply to and be accepted by FHL before they can register. There are different registration procedures for UW and non-UW students. Marine Biology Quarter (MBQ): UW-matriculated students will register themselves through MyUW, with required add codes received from FHL staff. Non-UW students will be registered by FHL staff. Research Apprenticeships: All Research Apprenticeship students will be registered by FHL staff; UW students should not attempt to register through MyUW.